PHOENIX — An experimental release of 38,100 cfs from Glen Canyon Dam will take place Nov. 5-10 at the world-renowned Lees Ferry trout fishery just downstream in picturesque Marble Canyon. The flows are short term, yet significant enough to preclude any fishing from occurring during the peak high releases. The fishing is usually excellent the week following these high flows because these flows make aquatic invertebrates (fish food) available to trout. Normal flows before and after the high flows should offer great wading and fishing this fall. 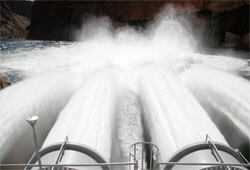 The Department of Interior will begin the release from Glen Canyon Dam Nov. 5. The flows will reach full capacity (approximately 38,100 cfs) by 2 p.m. on Nov. 5. Releases will be maintained at peak levels about 2.5 days (60 hours) before ramping down. Normal operations of 6,500-9,000 cfs will return on Nov. 8. The goal for the Department of the Interior is to move sand stored in the river channel and redeposit it to rebuild eroded sandbars and beaches downstream of the Paria River in Grand Canyon National Park. See more information from the National Parks Service.